What will 2016 bring for the tourism economy in Madison and Dane County? This year is poised to be one of the strongest years for our destination. 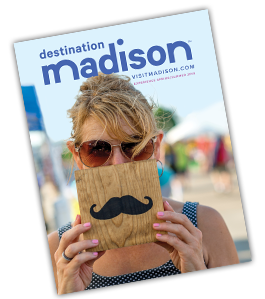 We will be increasing our exposure of Madison as an event and visitor destination, and identifying what this destination needs to invest in to remain competitive. Coming off one of the best event sales years for our organizations--where we booked $1.3 million in future contract revenue for Monona Terrace and the Alliant Energy Center, and more than 100,000 future room nights--we will be busy welcoming new and familiar events to the destination in 2016. As mentioned previously, we are kicking off our Destination Visioning initiative this month. This comprehensive process will engage several hundred local individuals, customers, business owners and elected leaders. We look forward to the results providing us with data to a) illustrate our destination’s position among our competition; b) identify opportunities for greater tourism economy success; c) engage others in the future of developing this destination and d) identify additional ways to “tell the Madison story” to visitors. On the digital front, we have increased staff support for all-things-digital and recently launched our revamped, responsive designed website. And, we are beefing up our social media presence on Facebook, Twitter and Instagram. Thank you for helping us welcome millions of individual visitors – and dozens of events - to Madison & Dane County and may all your hopes for 2016 come to fruition. When Heritage Tavern opened its doors in 2013, it may have been one of Madison’s most anticipated restaurant openings. Owner and Executive Chef Dan Fox planned to put his own spin on combining upscale, farm-to-table cuisine with an approachable atmosphere. What he could not have planned was being named Madison Magazine’s 2013 Chef of the Year, a James Beard semi-finalist for the Midwest region in 2015, and having Heritage Tavern earn OpenTable’s Diners’ Choice award in 2015. But his influence extends beyond the four walls of his fine dining restaurant located just a block off of the Capitol Square. Heritage Catering is getting rave reviews, too. Part of that success is due to the fact that Dan has spent the last decade developing relationships with local growers and producers. Of course, he is also a farmer himself; Fox Heritage Farms supplies pigs to Heritage and other renowned kitchens in both Madison and Milwaukee. The result is a finer craft approach to catering for events, business lunches and dinners, and weddings. Visit the catering website to learn all about the Heritage team, view sample menus and more! One of the perks of being a partner is the chance to offer special pricing from your business to your partner peers—and secure some savings in return! GMCVB partners can save 15% on their next stay at The Edgewater! To secure your savings, book here: http://bit.ly/1MhPV9u. GMCVB partners can save 5% on Enterprise Rent-A-Car rentals at 6,500 locations nationwide—for business or personal use! To secure your discounted rental, visit enterprise.com and enter 44D0747 under Promotion Code or Account Number. This offer cannot be combined with other corporate discounts. Focal Flame Photography offers versatile video production services, including live-streaming of events, product or service demos, customer testimonials, informational content, inspiring stories, behind-the-scenes takes and more. GMCVB Partners that book by April 1, 2016, will receive a 10% discount on that video production project (mention "GMCVB Partner"). Contact Focal Flame at 608.772.0048 or clint@focalflame.com. Visit our partner-to-partner offers page to view all current offers. New faces mean new places to direct your GMCVB partnership queries. Read on to learn about who to contact and how to find key information that will help you maximize your investment! Hyper-local Wisconsin farm-to-table restaurant featuring good eats, local beer and spirits. Our historical venue has additional floors and a hideaway speakeasy for meetings and celebrations. With more than 20 years of experience, Lauer Realty Group has a down-to-earth approach while using the latest technology. Choose the team who knows Madison best! Sundance Cinemas is a 6 screen complex offering the best in art house, independent, international, documentary and select mainstream cinema. Enjoy plush stadium seating, reserved/advance tickets, upscale amenities and more! EZ Office Products is celebrating 10 years as the place to shop for office supplies, from staplers to desk chairs—and everything in between. This independent, woman-owned business has received many awards including multiple Executive Consumer Choice Awards from IB Madison. It’s already been a year since The Buckingham Inn opened its doors as a bed & breakfast near the UW-Madison campus. This classically restored 1911 residence features three luxury guest suites, spacious private baths, savory breakfasts and off-street parking.